Sometime back Egon implemented a simple group contribution based volume calculator and it made its way into the stable branch (1.4.x) today. As a result I put out a new version of the CDKDescUI which includes a descriptor that wraps the new volume calculator as well as the hybridization fingerprinter that Egon also implemented recently. The volume descriptor (based on the VABCVolume class) is one that has been missing for the some time (though the NumericalSurface class did return a volume, but it’s slow). This class is reasonably fast (10,000 molecules processed in 32 sec) and correlates well with the 2D and pseudo-3D volume descriptors from MOE (2008.10) as shown below. 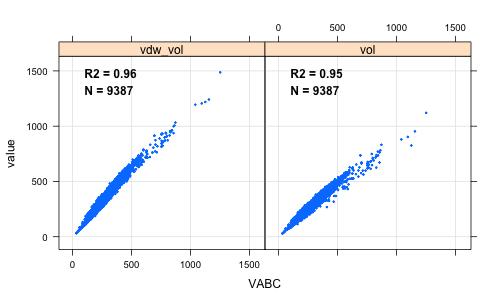 As expected the correlation is better with the 2D version of the descriptor (which is similar in nature to the lookup method used in the CDK version). The X-axis represents the CDK descriptor values. That sometime was 10 days ago. And since that evening 10 days ago, and the train back home yesterday, I did not work on it. What surprises me, is how fast we can develop cheminformatics approaches with the CDK, basically only limited by the availability of data.